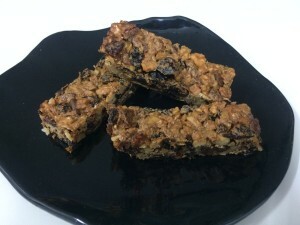 These quick and simple fruit and nut bars can be made using almost any combination of dried fruit and nuts, but we have suggested an ingredient list you may find appealing (*). If you have health reasons for avoiding gluten, the recipe can easily be converted to a gluten-free version. Replace the plain flour with a commercial gluten-free baking mix, available in the health-food section of most supermarkets, or you can make your own flour mix using this recipe. The bars will hold together slightly less well using gluten-free flour, but will still be delicious. Pre-heat oven to 160 °C (fan-forced). Chop walnuts into 5-10 mm pieces. Cut dried cherries and pears into small pieces. In a bowl, mix together chopped walnuts, dried cherries, dried pears, sultanas, currants, chocolate chips, dark brown sugar and plain flour. Make sure the fruit and nuts are evenly coated by the flour, as this is important for binding the final mixture. Beat egg with vanilla bean paste. Mix beaten egg thoroughly with remaining ingredients. Transfer the mixture into a 20 × 20 cm tin lined with baking paper, allowing the paper to overhang the edges of the tin. Press down well to form an even layer. Bake 40 min until golden brown, then let cool thoroughly on a rack. Use the overhanging edges of the baking paper to help remove the cooled square from the tin in a single piece, then cut with a sharp knife. Makes 12 bars. (*) In Australia, you can buy dried cherries on-line here.